The Zero Injuries campaign means that when SRR employees work a month without any injuries that result in days away from work, the company presents a $500 check to a local charity selected by the employees. Since beginning the Zero Injuries campaign in August 2009, SRR has donated $22,500 to local charities. The United Way of Edgefield County was selected for August 2013 as the charity of choice by one of SRR’s employee Local Safety Improvement Teams (LSIT). Each liquid waste facility has an LSIT. Each month a different LSIT selects a charity for the SRR Zero Injuries donation when no injuries result in a day away from work. 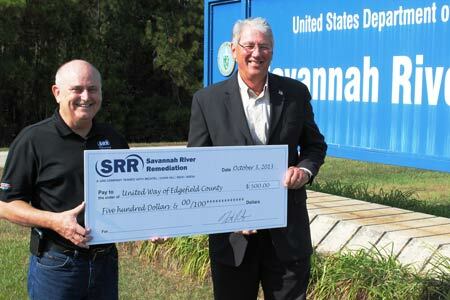 SRR is the liquid waste contractor at the Savannah River Site, which is owned by the U.S. Department of Energy. SRR is comprised of a team of companies led by URS Corp. with partners Bechtel National, CH2M Hill and Babcock & Wilcox. Critical subcontractors for the contract are AREVA, Energy Solutions and URS Professional Solutions.